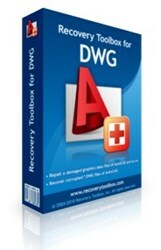 Ultimate DWG Recovery Tool Released by Recovery Toolbox, a Leading Supplier of Recovery Solutions. This DWG recovery product has great potential, especially with the all-new engine that its been now fitted with, says Victor Bobrov, Lead Software Engineer at Recovery Toolbox. Our program is by far the most efficient, fast and reliable tool of its kind on the market and we hope to see a lot of users happy with the results of its work.